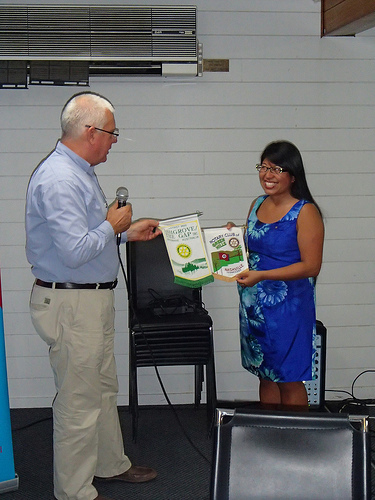 Tonight, I visited the Rotary Club of Ashgrove/The Gap. They meet at the Ashgrove Golf Club on Wednesdays at 6:15pm for a 6:45pm start. From my first day in Brisbane, one of their members and current secretary, Shaughn Forbes, greeted me at the airport with my host counselor, Alan and his wife Sandy! Shaughn also serves as the Scholarships Chair Person at the Rotary Foundation Committee and is the biggest supporter of Rotary Ambassadorial Scholars and Peace Fellows. She even offered to give me a tour of campus when I first arrived, helped me sort a few things, and gave me advice on cell phone plans which is only one of the many things one has to take care of when moving to a new country! I spoke about Nashville and how I became a Rotary Ambassadorial Scholar. A few members had just returned from a grand tour of the US! They did Route 66 and missed Nashville so they were very keen to chat with me after the meeting. Another important aspect of my visit is the opportunity to exchange banners. The exchanging of banners is a tradition of Rotary and serves as a tangible symbol of international friendship. The banners can then be used as decoration and display how the clubs around the world are connected. In 1959, the banner exchange became so popular that the Rotary International Board made a strong recommendation that each banner include a picture, slogan, or design that exemplified the club’s area. I like the Rotary Club of Green Hills’s banner because it has the Tennessee flag with a green pasture and trees which portrays the area justly. All of the Australian banners have been much larger in shape! I have really enjoyed exchanging banners and look forward to bringing them all back to Nashville when I give my debrief. Feel free to check out the rest of the photos from the meeting here.